Many many many moons ago, I bought a beautiful fat quarter bundle of Piper by Dear Stella from the Fat Quarter Shop. I just fell in love with this bundle mostly because it had my two favorite colors, purple and green, but because it had such fun prints! I really have no idea why I let this bundle sit so long. I did a very dense swirl quilting pattern and it was super fun, but boy my arms were sore! I used the remaining FQ's and some quilter's linen for the back. I was thinking I would use that originally for the front but it was too light for my liking and I loved the natural hues in the flax seed linen. I used the last little bit of Piper to make a two print scrappy binding. Big relish thought the print with all the tiny dots were sprinkles! Gotta love her! 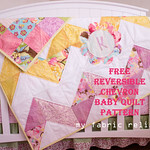 Also, if you want to see some more Piper in action, Paula over at The Sassy Quilter is also working on a Piper quilt. I cant wait to see Paula's when it's finished! Go on over there and cheer her on! 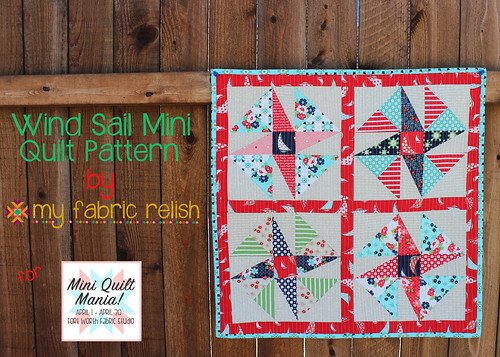 Linking up with some of my friends on the right and Crazy Mom Quilts! What a fabulous quilt - love the colours with the linen. Must get me some of that white with the 'sprinkles' on it! Wonderful cinnamon bun quilting - I do not have the nerve for that yet over here, though I do really pine after it!!! Thanks so much! Im glad I decided to use the Essex linen! I hope it holds up well. The buns are actually kind of easy once you get the motion down. I like them more than loops I think. Hope you give them a try! Thanks for visiting! 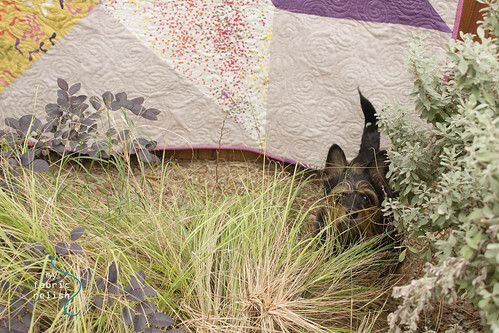 Fantastic quilt and love the pup peeking out. Thanks Billie! He was so curious as to why I was in the bushes. Normally when Im in the bushes, Im looking for a bunny to save before the other pup gets it. He is my official bunny hunter because he will find it and then bark instead. Thanks for visiting! Thanks so much Christine! Have a great weekend! Thank you, Margaret! Have a great weekend! Thanks Fran! I completely agree! So glad they are finally out to display! Have a super weekend! Beautiful. I really love how the quilt really showcases the fabrics. Thank you Paula! I couldn't agree more! I just love the purple! Thanks for visiting and have a great weekend! Aww, thank you so much Lauren! It was nice to do such an easy quilt! Thank you! Yes, It still amazes me how much a simple HST can make a quilt so different. Thanks for visiting, Chrissie! This is absolutely gorgeous. Love it! Thank you, Audrey! It's fun doing a big giant quilt...fast and easy! Thanks for visiting today! 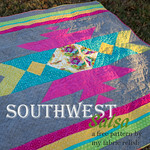 The quilt is stunning, and I think those colors are beautiful and calming. I love it! Thanks so much, Katie! I really love the linen...and it got so soft and crinkly after the wash! Have a great weekend! Oh, it came out so perfect! 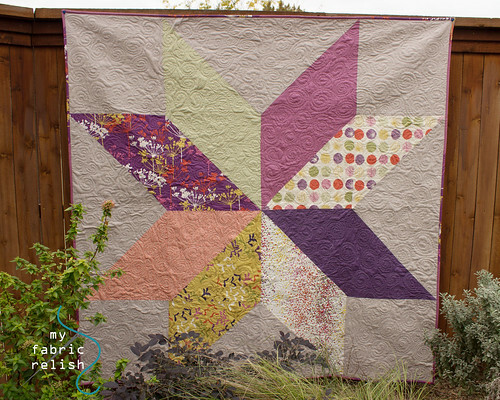 I just love the way the fabric really shines in the big star. Finished up my top this week now just got to get some pictures if the weather cooperates. 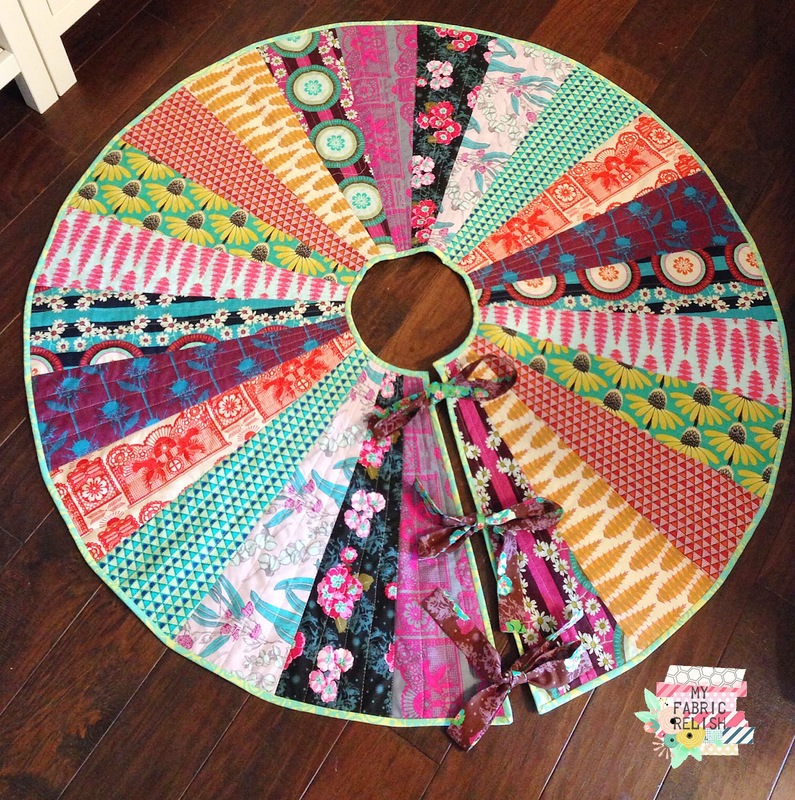 This is so pretty, love your color choices and your quilting looks wonderful. Thanks so much, Deb! 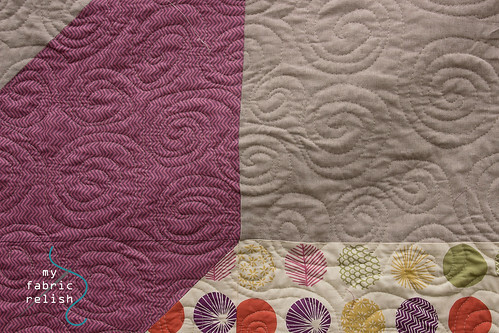 The swirl/bun quilting can be fun and addicting! Have a great weekend! 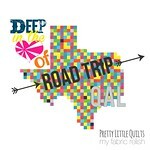 It's gorgeous and I love the quilting! Thank you, Christa! I might need an intervention with this FMQing swirl...so fun! Hope you have a great weekend! It's wonderful! I love the binding too, it's perfect. Thanks so much my dear! Thanks for visiting and the sweet comment! It`s stunning .Love all about your quilt! Aww, thanks so much Rosa! So glad you love it! Have a great rest of the week! Lovely! Such nice fabric. Great job! Hi Izzy! Thanks so much! Thanks for stopping by to visit! 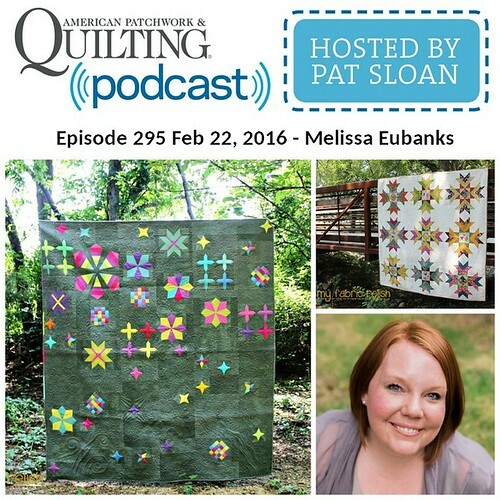 Love your quilt - especially the quilting! I made this quilt top a couple of years ago and it's just been sitting in a drawer ever since because I am too scared to quilt it...I haven't quite mastered free-motion quilting and always stick with straight lines. 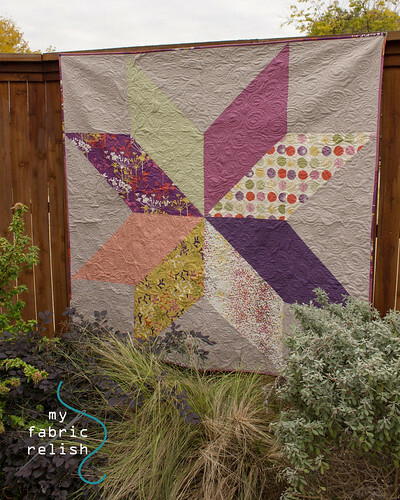 Your quilt is a beautiful inspiration! Oh, Jennifer, YOU MUST get that quilt top out and finish it! You can just call it a chance to practice your FMQing. If it turns out terrible, which I doubt it does, at least it looks better than being in a drawer...right?! haha Have a great week and thanks so much for visiting and leaving a sweet comment.